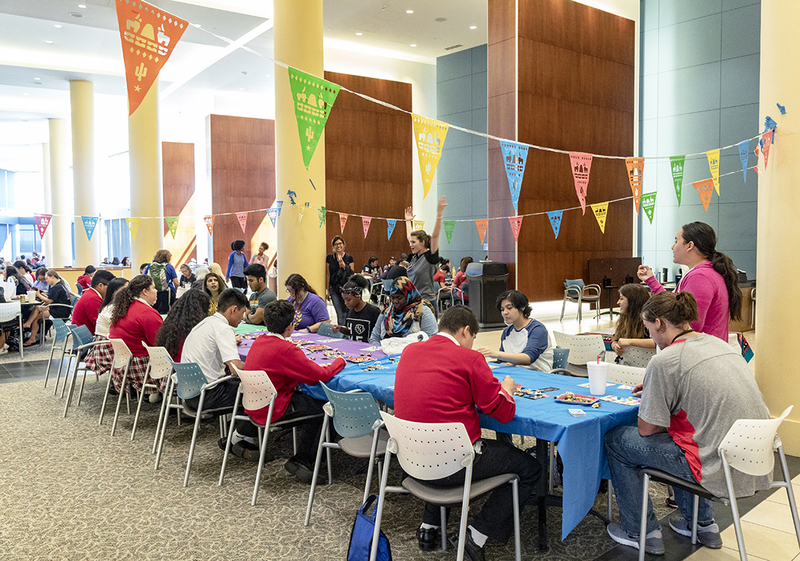 TR students gathered in the Riverfront Cafe to play the popular Mexican game lotería during a Hispanic Heritage Month event Oct. 4. The cafeteria was filled with students as many students on school field trips were on campus during this event. During the lunch hour, a long table with 20 chairs was laid out with a green, purple and blue table cloth covered with lotería playing cards, mini-candy bars, beads and uncooked beans. Lotería uses images on a deck of cards but is otherwise similar to bingo. As these images are called out, a token is placed over the image on the game card. For instance, the beads and uncooked beans were used by the students as TR student worker Daniela Varela announced the card images. After three rounds of playing, three students left with miniature piñatas filled with candy as their winning prize. “I feel like I’m about to lose my voice,” Varela said. TR student development associate Angelica Cuellar said the game was an inclusive activity to get people interacting. World Language Institute, a school in Fort Worth from grades 6-8, had many of its students participate. Maria Guadalupe Ayala, who was a chaperone, really enjoyed seeing a game played in her culture being displayed to students. TR student activities coordinator Kelsey Bratcher said lotería is a great event the staff enjoys hosting each year. “You get to learn a little bit of the Spanish language, and anyone can play,” she said.